New paraben-free formula, the Ultra Rich Face Cream is specially formulated to hydrate, nourish and protect dry and damaged skin. The perfect moisturizer for those with dry or dehydrated skin, who are in need of intensive hydration. The formula is exceedingly dense and creamy, although rapidly absorbed without leaving an oily film. It has been proven to increase skin hydration for 24 hours. In addition to 25% shea butter, the formula is made with wheat and chestnut extracts, which strengthen the skin. These extracts are rich in vitamins and minerals to help replenish the skin’s hydrolipidic film and restore balance to the skin’s barrier, defending it against harsh environmental conditions. Apply morning and evening on the face and neck, on clean dry skin. This cream is so rich and hydrating. A mild scent also. I will use this on my neck and chest in the summer but only on my face in the winter. Love it. This is my new winter staple! It's just a terrific moisturizer. I wish it were cheaper, but the value is totally worth it. I would suggest this if you have dry and sensitive skin. There is a faint scent to it, which is mild and nice; however, I'm sometimes sensitive to smells and this has irritated me on one occasion in particular (but I was sick).It absorbs well, leaves your skin well moisturized, and is not greasy. It's a cream, so I wouldn't call it lightweight, but it's very smooth. I use it after I wash my face at night. I put it on when my skin is slightly damp, after I've pat the excess water away. When I need extra daytime moisture, I wear it under my daytime moisturizer which contains spf. I really love this product. I'm planning to get on differin soon, which I've used in the past, and I think this will be great for it. You really need to make sure you have a great moisturizer on hand when you use retinols. I've been using this cream for over a year now. I first tried it after reading a review on another site that recommended it as an alternative to one of the most expensive creams on the market. My skin is both sensitive and dry, and I love this cream as it has never irritated my skin and hydrates very well. it also has a nice fragrance and is reasonably priced. I've used this product for almost a year and am still as happy with it today as I was on day one! It absorbs quickly - remember, a little goes a long way! The creme smooths my skin and helps to retain moisture all day long. I use it both day and night - no need for a special night creme any longer. Also, I have sensitive skin that breaks out easily and I've had no break-outs since I've started using this one. Could it be my imagination or have my pores even gotten smaller, too? Give this one a try! Nothing has worked on my dry, flaky skin in the winter except for La Mer, but after trying this cream, I have found the equivalent to La Mer at a fraction of the cost. If, like me, you suffer spots and dry sensitive flaky skin - this is your product. SHEA BUTTER IS THE BEST MOISTURIZER BAR NONE. THIS DOES JUST THAT BUT HAS NO ANTI AGING BENEFITS FOR PRIOR DAMAGE. MOISTURE IS THE KEY TO PREVENTING NEW DAMAGE. I PREFERRED THEIR DISCONTINUED SHEA NIGHT CREAM. IT WAS RICHER. I have a severely dry and sensitive skin. 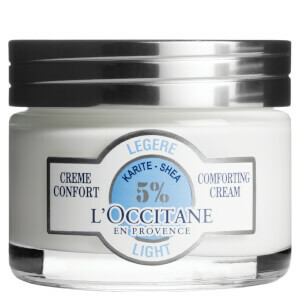 I've tried lots of moisturizer even the expensive ones like La Prairie and La Mer, so far this is the only one that can keep my skin moisturized during the harsh winter days. it leaves your skin soft and supple all day. I'm impressed! Very moisturizing. Perfect for use after peels or microdermabrasion - gives a beautiful glow. Skin looks so healthy.